For many companies, Microsoft Dynamics 365 for Finance and Operations (D365FO) is the core of their financial management system, and protecting against fraud, misstatements, and errors is a critical component of running D365FO. Sometimes though, it’s hard to know where to start. This is a book about D365FO security written to help users, administrators, and auditors better understand how to plan, implement, and audit D365FO security for their financial operations. Security books tend to be heavy on theory or application, rarely including both. 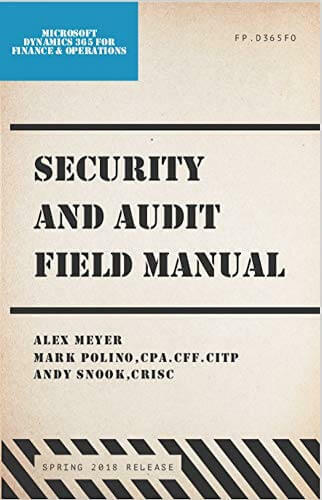 This Security and Auditing Field Manual is designed to help users understand sound control principles and how to apply them in D365FO. There are many questions about the built-in Segregation of Duties functionality within Dynamics AX and D365FO, how it works, and any short comings that it has? To help answer those questions, I created a white paper that compares the native SoD functionality to the functionality that the Fastpath tool offers surrounding this area. This project is designed to convert the XML output a user gets from exporting security from the user interface in D365FO to the XML needed to create security in the AOT. This project will process the output of a task recording from either Dynamics AX 2012 or Dynamics 365 for Finance and Operations and show the menu items consumed during the recording. Building roles and implementing strong security in Dynamics AX/365FO can be a daunting task, so Fastpath created a tool to assist in designing security roles. Security design is an important part of any security setup. Roles in Dynamics AX/365FO were designed for ease of access, not segregation of duties. You can use this worksheet to recognize where you have conflicts, and build better roles to fit your company’s needs.